The banned United Liberation Front of Asom (Independent) has allegedly served an extortion notice on former Arunachal Pradesh minister Bida Taku, demanding Rs 10 lakh. 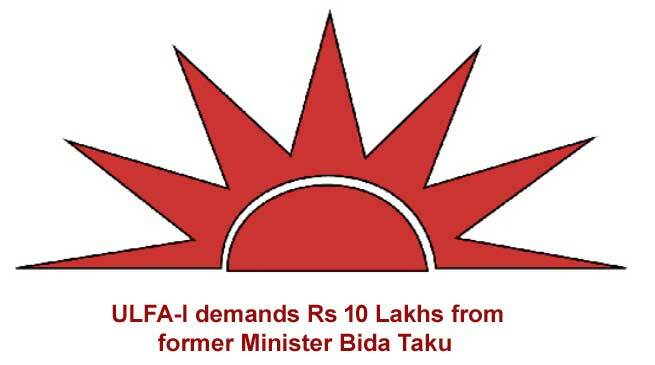 The ULFA (I) served the extortion notice on Saturday and threatened him with dire consequences if he failed to comply with the demand, according to the former minister. Taku, who unsuccessfully contested the 2014 Assembly election against Deputy Chief Minister Chowna Mein from Lekang constituency in Namsai district of the state, filed an FIR with the Mahadevpur police station yesterday. The Mahadevpur police station has confirmed the FIR filed by Taku in regard to the extortion demand. Taku served as minister of state for RWD, Education and Sports and Youth Affairs from 1996 to 1999 under Gegong Apang and Mukut Mithi ministries. “I suspect the involvement of some local political leaders in provoking the ULFA (I) to target a person like me who do not have a house to live in, the former minister claimed.